Economics both describes the way economic forces work and studies the effi ciency, or ineffi ciency, that results. These two aspects of economics have probably never been wholly separated, and it is debatable how far it is possible or desirable to separate them. The question will ultimately be answered by evaluating these different theoretical methods in terms of the results they deliver. The theory of economic effi ciency uniquely incorporates problem of ideals of good conduct and welfare; in short, of morals and ethics. Preface to Social Economics presents thumbnail sketches describing the growth of our awareness of social problems over the past century. Beginning in the nineteenth century, the sciences, both natural and social, made us aware of many factors governing our behavior. With the discovery of controllable external social causes, the responsibility for problems (and change) shifted from the individual to the group. Studies of industrial accidents are an example. When it was learned that the number of injuries per hour increases with the length of the working day and with the absence of mechanical safeguards, it led to a demand for shorter hours, safety laws, and compulsory accident insurance. Similarly, as we begin to understand the connection between the rate of interest with booms in building, unemployment ceases to be a matter of individual responsibility and becomes a problem for business and society. This classic book, initially published in 1936, illumines a growing knowledge of controllable causes of social evils. 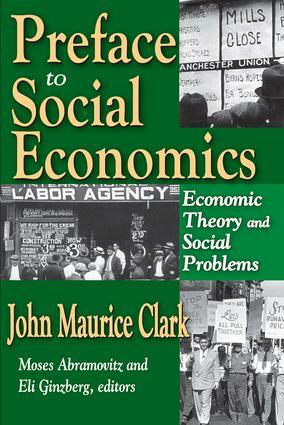 John Maurice Clark was a long-time professor of economics at Columbia University. The editors of this volume Moses Abramovitz and Eli Ginzberg were both students of Clark, and prepared this volume under his direct supervision.